Together 4 Children Rights project aims to build childrens capacities to monitor and report on their rights, as well as to raise the awareness of other institutions, parents, primary school councils and all other developed mechanisms for protection of the rights of child, about the situation of children rights in Kosovo based on the International Convention on the Rights of the Child. The project aims to monitor implementation of the International Convention on the Rights of the Child by the children themselves, thus establishing a first relation at the country level, on how much this Convention is being implemented in our country, and what are the institutions responsible as well as other stakeholders doing for implementation of this Convention. With the drafting of one such report, Kosovo will have an analysis of implementation of this Convention on the ground which will help our country and institutions to enhance their mechanisms, or develop the necessary mechanisms for better implementation of the Convention on the ground. The project also aims to create a monitoring group by the very children at the country level. 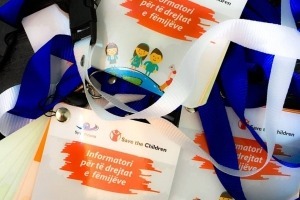 Syri i Vizionit together with Save the Children have made the selection of 24 children in Kosovo level, which will be trained on collection of data for childrens rights in Kosovo level. Selection of children was done through the open competition in media to give the opportunity to interested children to apply for becoming part of the monitoring group. The report that will be written based on the data collected by this group of children will be published and handed over to all the institutions responsible of protecting childrens rights. A national conference, where all the stakeholders will be invited and findings of the report will be published, will also be organized. The project is implemented by Syri i Vizionit organization with the financial support of Save the Children. It is implemented throughout the territory of Kosovo providing monitoring of the International Convention on the Rights of the Child in the whole territory of the Republic of Kosovo, thus including 37 Kosovo municipalities, or 1.467 settlements. The project will help institutions to have a monitoring report on the implementation of the International Convention on the Rights of the Child. It will also help the institutions to analyse the impact of implementation of various strategies that they have drafted on protection of the childrens rights. Our country will also have a comprehensive report on the field of childrens rights at the country level, on which it will be called on until there is no other report that will challenge it. The report to be published will encourage Kosovo institutions at the local and central level to develop mechanisms for monitoring the Convention on the Rights of the Child. The report will also serve as an advocacy document towards institutions to make the children voice be heard and to draft practical policies according to childrens needs, thus impacting on improvement of the childrens rights in Kosovo, same as on implementation of the Convention on the Rights of the Child. All the childrens rights guaranteed with the International Convention shall be treated with this project. More importance shall be paid to these rights: Protection of children from violence and other negative phenomena (discrimination, bullying, trafficking, etc. ), healthcare, the right to education and their social welfare. Aside from being guaranteed with the International Convention, the rights of Kosovo children are also protected with local laws; however, their implementation is not happening. Kosovo is the country that invests the least in region on education and protection of childrens health and this was also assessed in different reports of local and international organizations dealing with protection of childrens rights. It is worth emphasising that no ministry of the Government of Kosovo has officials for childrens rights who are engaged full time and are focused only in this role. Such officials are not either present in municipalities, although there are coordinators for childrens rights in municipalities, they perform in different positions of certain directorates, but they perform the position of childrens right coordinators on voluntary basis. Kosovo Government has drafted strategies and action plans related to implementation of the International Convention on the Rights of the Child, such as the: National Action Plan on the Right of Children in increase of childrens involvement in pre-school education; The Action Plan on Prevention of School Dropouts; Strategy on the health of the mother, adolescent and reproductive health, as well as the 2011-2015 Action Plan. Over the course of its work, Syri i Vizionit has developed the approach that it uses in all the projects by involving all the stakeholders responsible of a sector and creating conditions for social dialogue. Through this approach, as an organization, we believe that if all the stakeholders share the responsibility among them and take over the responsibility to report on responsibilities taken over, the results will be sustainable and the goals envisaged in the project shall be achieved. Throughout implementation of this project, Syri i Vizionit will hold individual meetings with all the stakeholders responsible for ensuring respect of childrens rights. During the meetings they will be explained what has been planned to happen and these stakeholders will be involved throughout the project in meetings, conference as well as other activities. Children are an integral part of the project. The project has envisaged that children should be part of the questionnaire implementation, same as to conduct the research, and draft the report with findings of the research. Children have also been planned to be part of activities designing, implementing and planning. Establishment of the committee for selection of children that will collect applications and make their assessments. Selection of children through public competition that will be published in daily newspapers. Training on development of capacities for staff and childrens group, in order for them to be able to identify and decide on monitoring. Workshop with children on drafting questionnaires and development of the first draft of questionnaires for children, parents and institutions. Data processing and report drafting with the data collected from questionnaires of all the groups. Submission of report findings in meeting with institutional officials for the childrens rights in Kosovo. Local and regional conferences in which the annual monitoring report will be published in the presence of institutions responsible for childrens rights. Launching of an attractive website for children, where the materials and data releated to childrens rights protection will be published. The child camp where children from the region and the Kosovo group will take part and get to know the monitoring work experiences that they do. Presentation and promotion of reports findings in the media to raise awareness of the public and of the very institutions on the situation of respect of childrens rights.